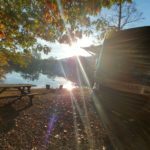 This is our favorite KOA location and dare we say our favorite KOA campground – if you want to read more about our personal experience at Asheville East KOA, click here! This is where I (Rhiannon) spent my summers as a child and was James’ very first KOA camping experience on our maiden voyage and it’s just an overall special place to be. 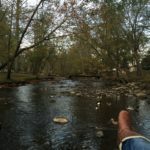 It’s in a little town in North Carolina, named Swannanoa and when you turn into the campground, you forget all about the little city you just drove through. You find yourself nestled in a beautiful place surrounded by trees, a river filled with ducks ready to be fed, a lake and plenty of activities to keep you busy and entertained. When I was a child, I always remembered how nice the people were, both the staff and other campers and that still stands even though there are new owners and a new era of guests rolling through. 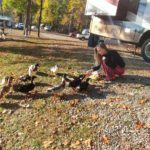 I still highly recommend this memorable KOA campground after 30+ years. It’s peaceful and beautiful, what more could you ask for. I-40, 10 miles East of Asheville. Exit 59, go North one block to signal (US 70), turn right, go two miles. Cell Phone Service – we have Verizon and we didn’t have any issues with our service. We did spend most of our online time using the KOA Wi-Fi and that worked fine for us. Perfect for RV, cabin and tent camping. RV sites provided with a campfire ring and a picnic table. Trash pick-up every morning. 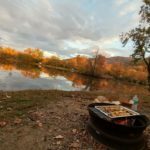 The spots aren’t crammed together, spaced out nicely so you have a little more privacy from fellow campers than most other campgrounds – Bonus! Large grassy areas for kids, pets and groups to play in. 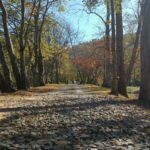 Abundance of trails and waterfalls along the Blue Ridge Parkway. Biltmore Estate – The 1895 French Renaissance Chateau, in case you’ve never heard of it. 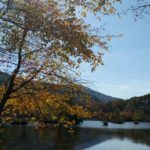 Antiquing & Shopping in Asheville and the quaint Black Mountain areas. 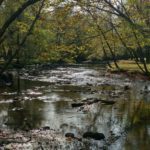 OR you can jump in the Swannanoa River that runs right through this awesome campground, swimming and tubing to your hearts content – trust me, it’s FUN! Start your morning off right with the lovely duckies! Enjoy this view for breakfast or a morning conference call – we certainly did! Afternoon break for a walk around this serene lake. Dinner cooked over flame, by the water, while watching the sunset? Seriously, why aren’t you here yet? !